First you are going to want to wash off the debris and dirt with a DRY toothbrush. If it is an old piece of jewelry you might want to wet the toothbrush and put some toothpaste on it and scrub it down. Then to renew the gold or silver shine you’re going to want to dry off the piece of jewelry, put a dollop of BRASSO metal polish onto the toothbrush and brush it all over the piece of jewelry. Make sure the jewelry is completely covered. Set the jewelry aside for 5 to 15 minutes and if you see green or blue it is eating away at the dirt and tarnish. Don’t worry it will not take off the silver or gold. Then after a few minutes you’re going to want to rub off all of the brass cleaner with a DRY washcloth. Then rinse it quickly with hot water and dry it off with a soft cloth. For glass and plastic beads, after you have polished the metal and restored the shine and color, spray some WINDEX on the beads and brush them with your toothbrush. Then rinse them with hot water quickly and dry them with a soft cloth. NEVER SOAK COSTUME JEWELRY IN WATER! IT WILL DAMAGE THE SETTING AS MOST TIMES GLUE IS — USED TO SECURE THE STONES. Many times I have found I THOUGHT the gold/silver plating had worn off and it really was just tarnished! You’ll be amazed, especially with old jewelry, to find how much plating stays on and just need a good polishing! If the plating has worn off, there are a few products you can use to fix the problem. I have found #1 works best because it allows the jewelry to stay flexible and you can control how much you want to use. Start with a CLEAN piece of jewelry. Take a small makeup brush and brush on the pigment powder. If it doesn’t adhere, cover the faded piece of jewelry with a TINY amount of Pearl Ex Varnish, then let it dry until tacky. Brush over the affected area with the pigment powder. Let it dry and brush the varnish over the area. 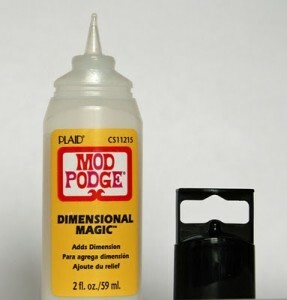 Use as little varnish as possible! Let it dry over night! You will be amazed at how beautifully this works.Pigment powders come in 32 colors so the possibilities are endless. I will show you more ideas on how to use this product very soon. #2 Nail Polish can be used to fix a small area, but not the entire piece. I use nail polish with DIMENSIONAL MAGIC to create stones and fix broken areas of enamel on jewelry. When you have an old brooch that has the enamel missing, you can take a 18-0 sized brush and carefully draw in the lines that need fixing. If a bracelet has a stone missing, you can paint into the cavity with nail polish and then put a drop of dimensional magic into the setting. Let it dry over night and repeat if necessary. This works best on cabochons and smooth stones. METAL REPAIRS: If you find a clasp is broken or the pin on the back of a brooch is broken you can easily fix it with Apoxie Sculpt clay. This works FAR better than glue! 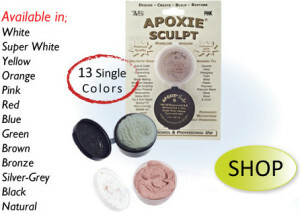 Apoxie Sculpt clay comes in two jars. Take a small amount the size of a pea and mix the two together. You will want to wear gloves for this as epoxy clay is toxic to your hands. The clay dries completely in 2 hours so you will have enough time to finish the piece if you plan it out first. Put the clay in the back underneath the broken piece and securely mold it around the broken segments. Use household items like tooth picks, pen tops, knife edges and the tops of pins to help you create the shape your are looking for. I will show you how to do this in more detail on the video. 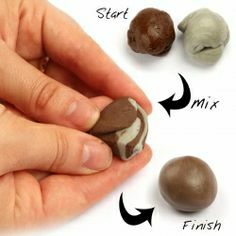 You can make bails for necklaces, re-attach clasps and much more with this clay as it is waterproof! Many plumbers use it because it is so durable. It can be sanded and sculpted with a drummel as well if you need to be more precise. 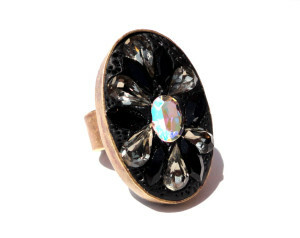 Here is a ring made of Apoxie Sculpt and rhinestones. Super glue can be used to glue stones back into the settings. It doesn’t work however when you are trying to glue to metal pieces together. Use Apoxie Sculpt for that. 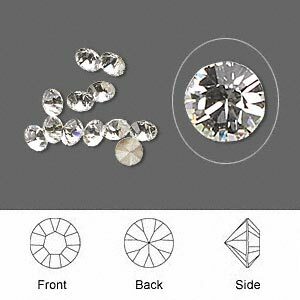 You can buy chaton crystals on ebay or BETTER YET, take and old piece of jewelry and gently pop out the old rhinestones and re-purpose them. Chaton crystals are the ones with the pointed backs. You can also use HOT FIX flat back crystals if you want an easy fix. 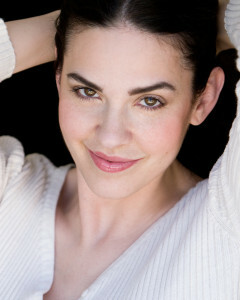 I will be teaching classes at the store in the early spring so stay tuned for a schedule. Feel free to write me with any questions you have. Remember, NEVER throw away your old costume jewelry. 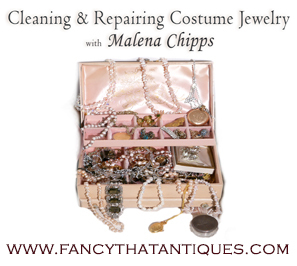 WE BUY COSTUME JEWELRY at Fancy That Antiques! Sometimes, depending on the piece, I will buy it broken if I can make new jewelry out of the old clasps and findings. Bring in your grandma’s old jewelry box and we will buy it all! Granted you won’t make hundreds of dollars, but it’s better than throwing it all away! RE– USE RE-PURPOSE RECYCLE and have FUN doing it! That’s my motto! Click here to learn how to use salt and lemon juice on brass. Also, here is a great article with some natural alternatives to Brasso.